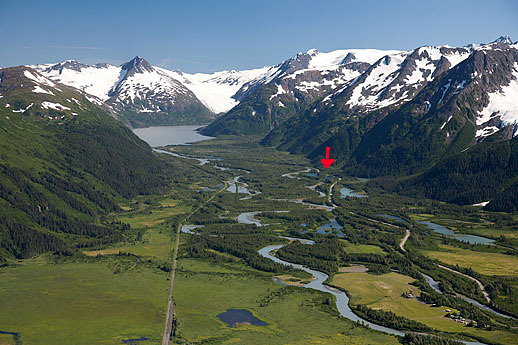 is a great place to view the glaciated valley and Portage Glacier." This is a continuation of the last entry describing our trip this morning from the Kasilof RV Park to Portage Valley. 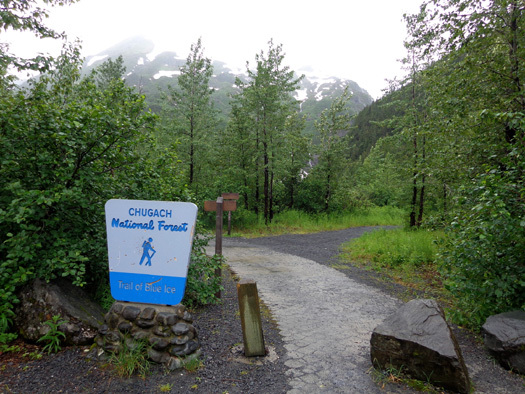 In this entry I'll describe one of the best US Forest Service campgrounds we've found in our travels and talk about our second visit to the impressive Chugach National Forest visitor center at Portage Lake. 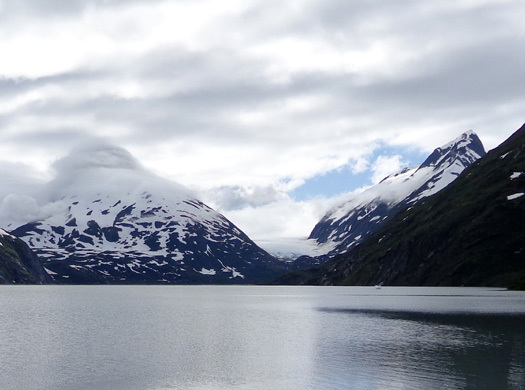 Our first visit to this area was on a day trip from Anchorage on June 27. Williwaw Campground is located approximately where the arrow points. 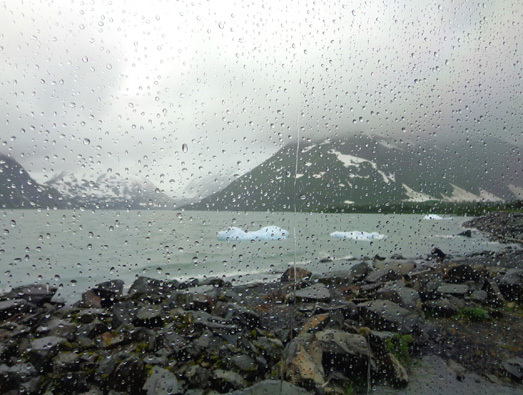 The rain continued off and on today from Kasilof to Portage Valley, getting worse as we approached this valley in the early afternoon. By bedtime it was just misty, with low clouds obscuring the mountain peaks. 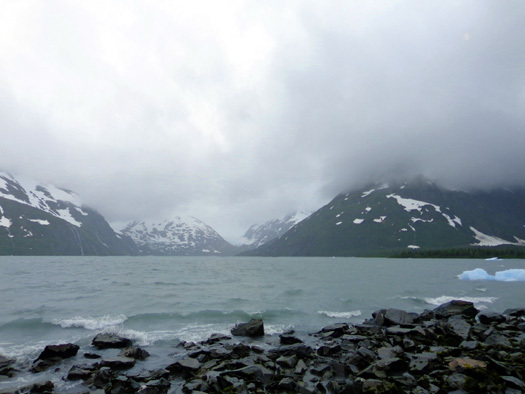 Weather is even more unpredictable here, between Prince William Sound and Turnagain Arm, than it is on the Kenai Peninsula. 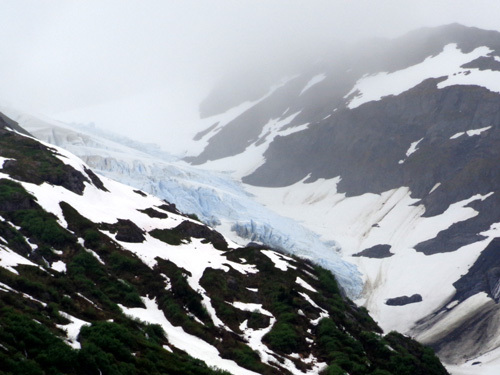 We did get some good views of Middle Glacier during the day, however. 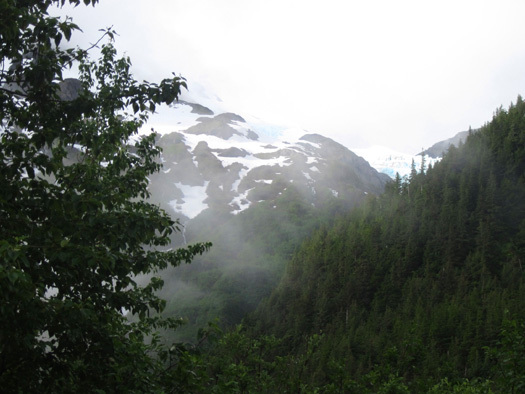 Middle is a "hanging" glacier located above our site, one of several glaciers visible in Portage Valley. 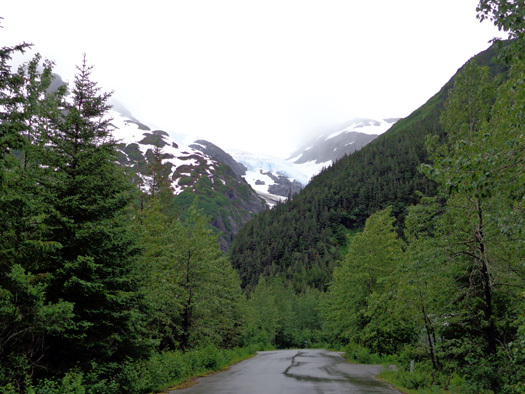 I could see even more of the glacier and mountainside from across the road on the Williwaw Nature Trail. I'll show photos from there later in the next entry. 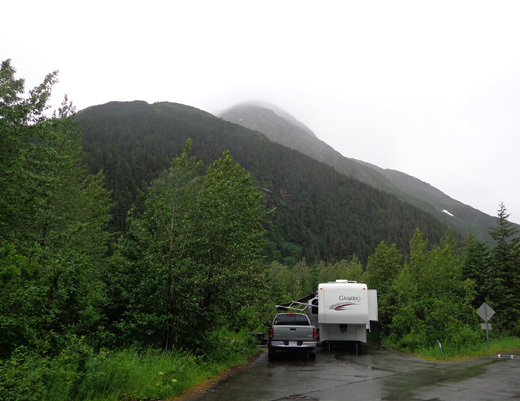 We really like the Williwaw Campground, which is located four miles back Portage Valley Road. When we were here on our day trip three weeks ago we drove through the nearby Black Bear Campground and decided the sites were too small for our rig. We didn�t notice Williwaw at the time or read about it until later so we didn't actually see it until we drove in today. Both Williwaw and Black Bear are attractive, reasonably-priced US Forest Service campgrounds with lots of trees and lower-growing greenery. 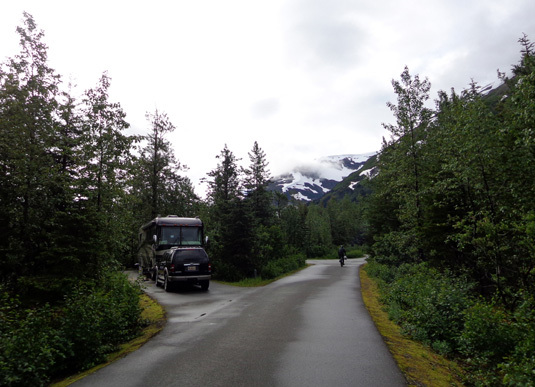 The campgrounds are connected by the Portage Valley Road and also by the awesome 5+ mile paved Trail of Blue Ice bike/hike path. We had a good choice of sites when we checked in at 1 PM. I'm surprised the campground wasn't more full but it is a Sunday afternoon when many state residents go back home after a weekend of camping. 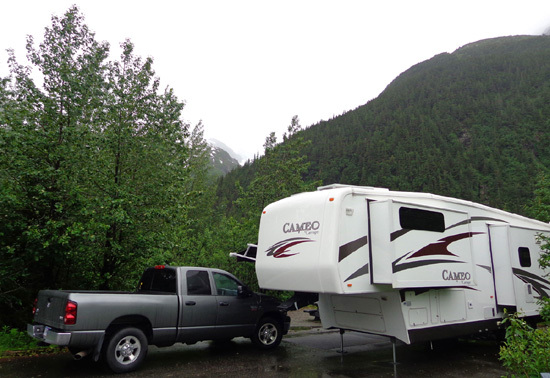 The long loops within Williwaw Campground are paved and wide enough for large rigs to pass through without hitting any branches. Most of the 60 sites are long enough for a large RV but not all of them have adequate turning room for a truck and 36-foot 5thwheel. Sites are large, with a lot of privacy trees/shrubs between them. 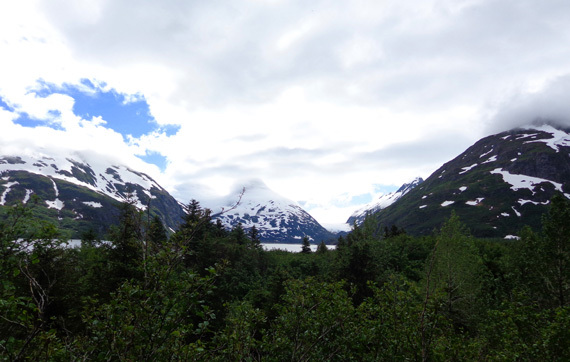 Our site has a view of the glacier when it's clear enough to see up there. A couple nearby sites have an even better view of it but they are more narrow. We are also close to an entrance to the Trail of Blue Ice. We were hoping to ride our bikes on it this afternoon or evening but it�s been too cold, wet, and windy. I did take Cody for a walk on it this evening and I'll show you pictures of it on the next page. Our half-price cost for this site with our National Park Service senior pass is $14/night ($28 regular price). Single (more narrow) back-in sites and pull-thrus cost less, $18/night regular or $9/night with a senior pass. Payment is by cash or check at the self-service check-in station at the host�s site. Sites have a paved RV pad, fire pit, and room to pitch a tent on gravel next to the picnic table. There are several water pumps and vault toilets at Williwaw but no hookups or a dump station. Black Bear doesn't have a dump station either. That could be a problem for folks staying in RVs for more than a few days. Reservations can be made for up to 14 days. We have a serviceable Verizon phone signal (2 bars) and MiFi works OK here. I wasn�t expecting that in a valley surrounded by trees and mountains. We don�t have any TV reception at our site, though. When we walked over to the host site with Cody to check in we talked with another fella who also just arrived. Wes, his wife Nancy, and their 7-year-old yellow Lab, Amber, are in a 36-foot HitchHiker at the other end of the campground. We found several things in common right away besides being Labrador retriever owners. We had a HitchHiker 5th-wheel before we got our Cameo. Wes is retired Air Force so the couple can use military campgrounds like we do. Not only were they at JBER about the same time we were there in June, they were also only two spaces away from us at the Seward Military Resort when we were there. We noticed their dog looks like Tater, a female yellow Lab we had, but we never did see them outside when we were so we didn't talk to them before today. This access to the Trail of Blue Ice is close to our campsite. Wes and Nancy are going to be here at Williwaw for two days, then they�re going back up to JBER to camp at Elmendorf again; they prefer that campground to the one we were in at Richardson (we prefer Richardson). We plan to go up to Anchorage tomorrow, especially since it�ll still be raining here and it�s supposed to be sunny part of the day there. We'll hunt for them on the other side of JBER in a couple days so we can spend more time with them. After eating lunch we drove a mile to the Begich, Boggs Visitor Center, one of the best-looking Forest Service visitor centers we've seen. We enjoyed a quick visit there on June 27 and wanted to go back to see more this time. This is a very scenic lake and backdrop but I think it looked more interesting the first time we were there. The pretty blue icebergs have melted now and it's not sunny like it was three weeks ago. You can see the icebergs and the exterior/interior of this very nice national forest visitor center in this entry from June 27. Wes and Nancy drove in right behind us. We all watched the Chugach Mountains glacier film in the theater at 2 PM, then talked for a couple hours afterwards as we slowly wandered through the exhibits. After watching the film we sat outside the theater to talk with Wes and Nancy and didn�t spend much time looking at exhibits. We didn�t do any of this the last time we were here, partly because we were in more of a hurry and partly because we didn�t realize we could get in free with our NPS senior passes. It�s a very nice visitor center and well worth the low cost of entry if you do have to pay. That film alone is worth the fee. 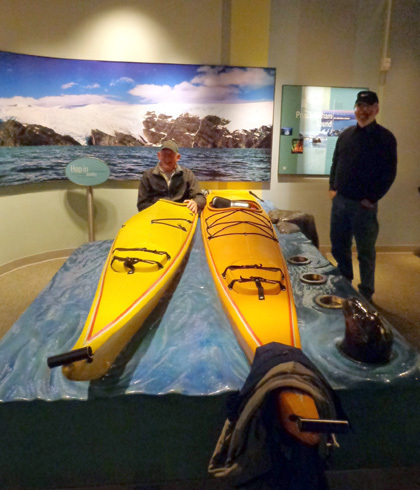 Jim sits in a kayak display while Wes watches. We�ll probably stay in contact with Nancy and Wes during and after this trip. In addition to all the time we talked with them at the visitor center and campground host's site, they also brought their dog Amber over to our camper and we talked some more this afternoon (Cody enjoyed the company, too). Topics included where all of us been in Alaska so far, current and previous RVs, their plans for the trip back to their home in Colorado, where they�re spending the winter, and much more. Nancy and Wes don�t do as much camping as we do and have no intention of selling the house they built in the mountains west of Pueblo several years ago. This four-month trip to Alaska is their longest to date. They plan to stay in one place in Arizona with full hook-ups from January to March. They�ve invited us to camp on their property sometime when we�re in SE Colorado. In the interest of continuity I'll show you some better photos of the lake that I took the next morning, July 16, during a long bike ride with Jim on the Trail of Blue Ice. 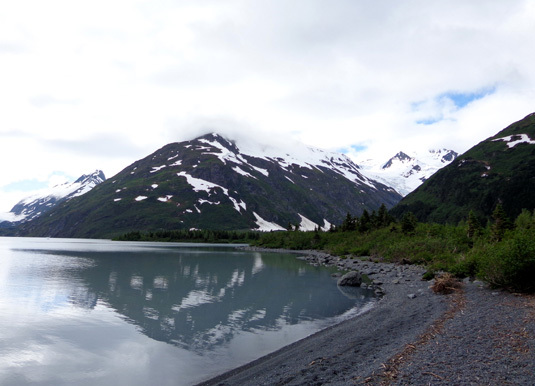 That's Burns Glacier visible across the lake in the photo directly above and the one below. 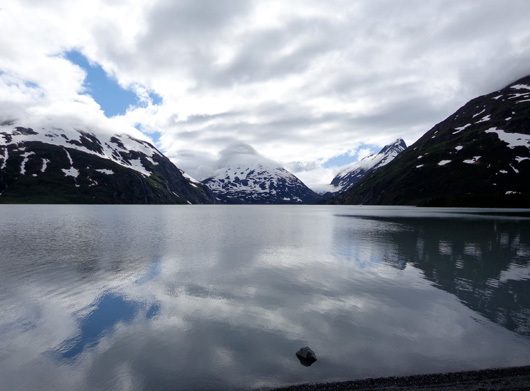 Portage Glacier has receded a couple miles behind the mountain on the right and is no longer visible from the visitor center. You have to take a plane or boat to see it now. Portage Glacier used to extend the whole five-mile length of this valley and up into the Harding Icefield. 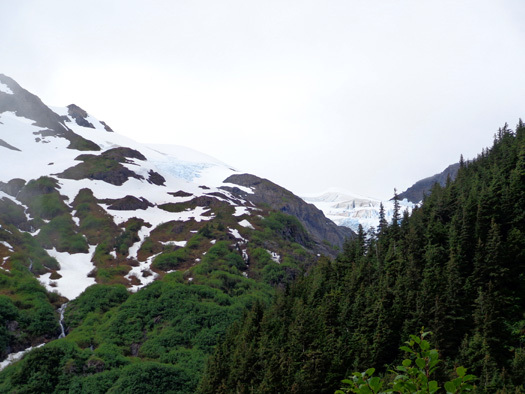 There's a graphic diagram of the recession of both Burns and Portage glaciers in just the last century at this Forest Service link. 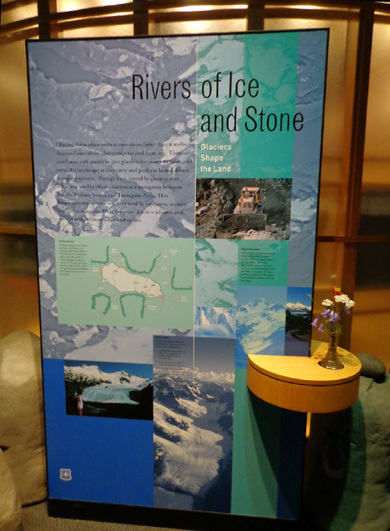 A hundred years ago Portage Glacier reached the current location of the Begich, Boggs Visitor Center. 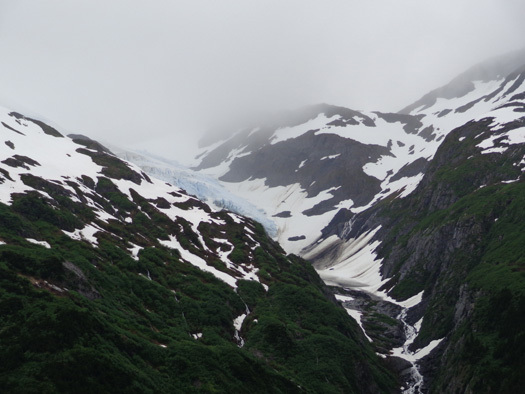 We hiked back to Byron Glacier on our June 27 day trip when snow still covered part of the trail. We won't have time to see it while we're here this time but may come back down here soon on another day trip from Anchorage so we can see what the trail is like with less snow and more flowers. In the next entry I'll show photos from the hike I took with Cody on the Trail of Blue Ice and the Williwaw Nature Trail this evening. A second entry will focus on different scenery on those trails during Jim's and my bike ride on the 16th. What great hiking/cycling trails!